Scientists in the DROPDATA network rely heavily on collaboration, however a wide range of instruments is available for droplet size measurement, often making comparisons between readings difficult to interpret. Relatively simple measures, such as transformation between volumetric and numerical distributions between size classes can be helpful, and we have been developing tools such as DROPDATA.exe and a standardised data format. Many of the readings currently shown on the DROPDATA pages have been obtained using a 'Malvern' particle size analyser. 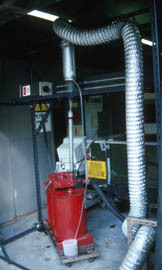 The instrument illustrated is housed in IPARC, and is shown mounted so that it can measure the output from an exhaust gas nozzle sprayer (ENS). Griffiths, J. & Bateman, R. (1997) Pestic. Sci., 51, 176-184. Training: in the use of computers (including the major software packages) and repair and maintenance of scientific equipment. R&D: ACIS has years experience in designing and developing scientific and technical equipment, both for government and privately funded research establishments, in order to meet specific needs. This originally covered topics such as pesticide application equipment and droplet production systems; latterly as independent specialists in the field of particle extraction and scientific equipment development. Programming: In addition to training in standard mainstream program usage, bespoke programs can be written to meet specific user needs. Several international patents have been taken out, which are being actively used in equipment. For example, a particle extraction device known as the Vortax is currently being evaluated for incorporation into a variety of equipment such as vehicle exhausts, bulk material handlers and particulate product extraction units.